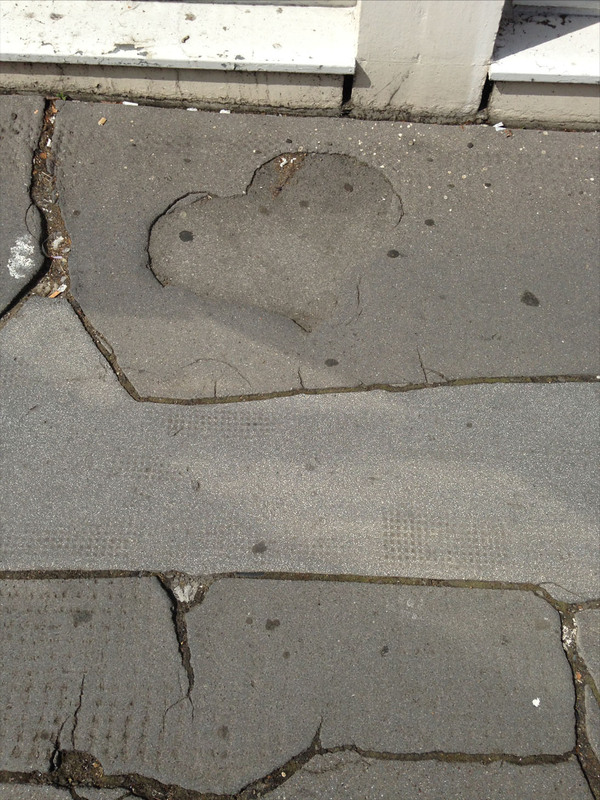 I try not to litter this wordpress blog with too many of my pictures of pavements. There’s tumblr* and instagram and facebook for all of that. But every now and then – just to break up the growing layer upon layer of words one or two might sneak past the censor. Like this one. Misty windows on the top deck of the 55 Bus to Oxford Circus as the first snow of winter starts to fall. Not so. This is the bears’ house. If I had a view like this to look down on every day, I would have the energy and inspiration to conquer the world. The trouble is, when you most need such a view, no-one gives it to you. I mean, who doesn’t know about ink blot experiments? A psychologist asks a patient to tell them what they see when they look at random inkblot patterns and from the answer they infer something about their personality. 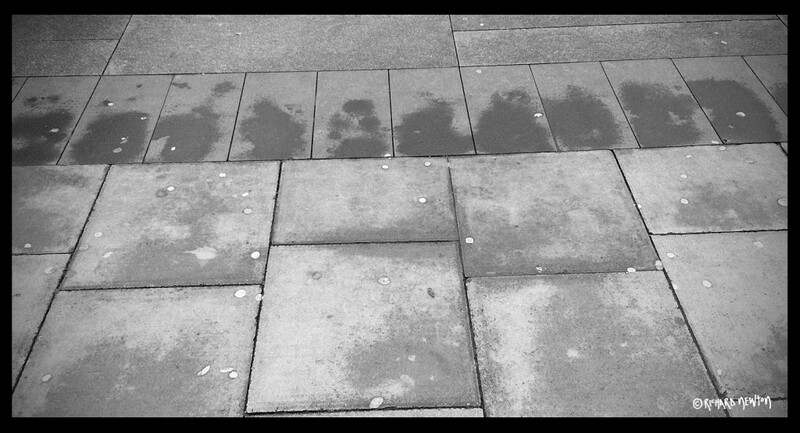 I’d like to show how the creative catalyst of inkblots can be found in pavements. But first, the inkblots. Named after the Swiss psychologist who invented them, “Rorschach” tests are used to assess a patient’s emotional state, mental acuity and so on. In the typical Rorschach test the patient is given ten inkblots to consider and discuss. Only a small part of the insight comes from what the patient actually perceives. It’s *how* they behave that tells the psychologist a lot. For example – Does the patient rotate the cards? Do they ask permission to rotate the cards or do they just do it? Do they stare at them long and hard or just peremptorily? Are they careful about what they say or do they talk long and freely about the different things they see? There’s an even older history of interpreting inkblots for fun. Initially in Germany Justinus Kerken produced book called Klesksographien in which he decorated inkblots with embellishments and poems. Then at the turn of the century some US writers proposed that Gobolinks, as they called them were a fun way to imagine monsters and fire up your creative daemon. 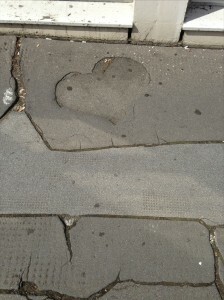 Which brings me to the pavements that I have been photographing (which surely tells a psychologist a lot). 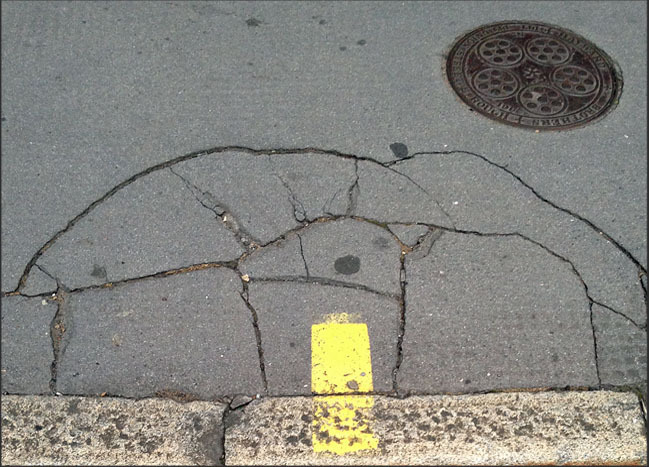 It began when, for an art project, I was building an alphabet out of photographed cracks in pavements. I’m still building that and it’s just as hard as you always thought it would be (Right? because you’d often wondered….). So all of a sudden I’m interrogating sidewalks for their creative potential. 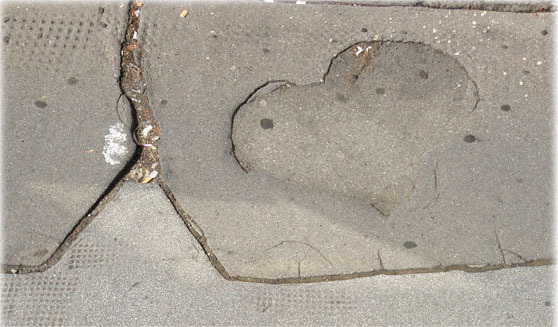 And I saw that the cracks and dents in pavements are like inkblots. The random and ambiguous patterns they create can be interpreted as almost anything. Like a gobolink. This is good news for those of us who spend too much time in the urban jungle staring at their feet. Because God knows such poor souls as we are, need to work harder for inspiring views than our friends living by the sea, mountains, fields and woodlands. So here’s my cure for boring sidewalks. Let your imagination loose and see whether there isn’t a better view really hidden in that boring tarmac and those implacable paving stones. And this of course, is a heart shaped sun rising over the pyramids. Sure, I’d rather have a view of the snow-capped Alps, the Mediterranean sea, or sip my coffee while gazing at the Wildebeest surging across the Zambezi pursued by crocodiles and lions. But “when you most need such a view, no-one gives it to you”. So now I’m finding them myself.